Flying each animal on the 11,000-kilometre journey will cost about $A60,500, but Ray Dearlove believes the expense and risk is essential as poaching deaths have soared in recent years. A retired South African sales executive who emigrated to Australia 30 years ago is hatching a daring plan to airlift 80 rhinos to his adopted country in an attempt to save the species from poachers. The rhinos will be relocated to a safari park in Australia, which is being kept secret for security reasons, where they will become a “seed bank” to breed future generations. “Our grand plan is to move 80 over a four-year period. We think that will provide the nucleus of a good breeding herd,” Dearlove said while visiting South Africa to organise for the first batch to be flown out. The Australian Rhino Project, which the 68-year-old founded in 2013, hopes to take six rhinos to their new home before the end of the year. Funding – from private and corporate sources – is nearly in place, and the first rhinos have been selected from animals kept on private reserves in South Africa. “We have got to get this first one right because it’s a big task, it’s expensive, it’s complex,” Dearlove said. When they are settled successfully in Australia, “then we hopefully will go up in gear,” he added. 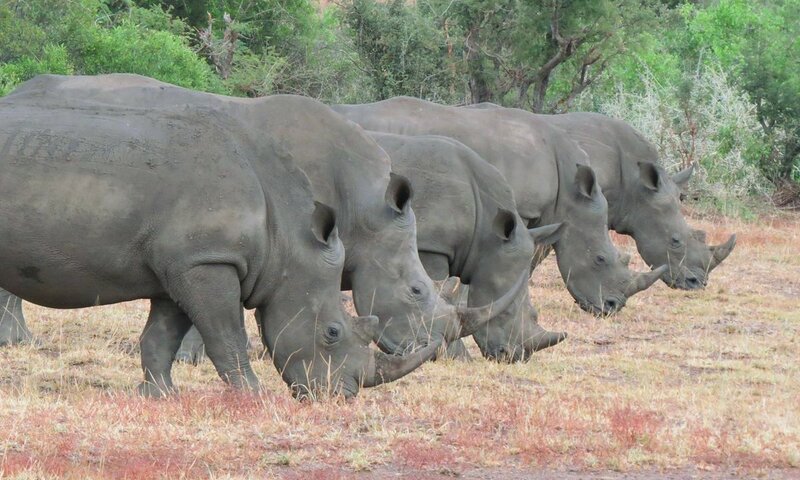 South Africa is home to about 20,000 rhinos, approximately 80% of the worldwide population. Poachers slaughtered 1,338 rhinos across Africa last year – the highest level since the poaching crisis exploded in 2008, according to the International Union for Conservation of Nature (IUCN). The IUCN, which rates white rhinos as “near threatened” as a species, says that booming demand for horn and the involvement of international criminal syndicates has fuelled the explosion in poaching since 2007. Dearlove still faces a big logistical battle to bring his dream to reality. “There is a lot of work that needs to be done because there is some lack of clarity in the proposal that they have made,” South Africa’s environmental affairs minister, Edna Molewa, said. The conservation group Rhinos Without Borders has been involved in moving at least 100 rhinos from South Africa to neighbouring Botswana in recent years. In South Africa, the government stepped back this month from supporting a controversial campaign to legalise the international trade in rhino horn. Some breeders say poaching could be halted by meeting the huge demand from Asia through legally “harvesting” horn from anaesthetised live rhinos. For Dearlove, Australia may sound like an unlikely and faraway solution to save the rhino, but the climate is suitable – and the need is overwhelming. “I’m sad that this is actually the situation which is being considered – because if the poaching would go away, there wouldn’t be a need for such a plan,” he said.